Seminary Road. Image created with Google Maps. 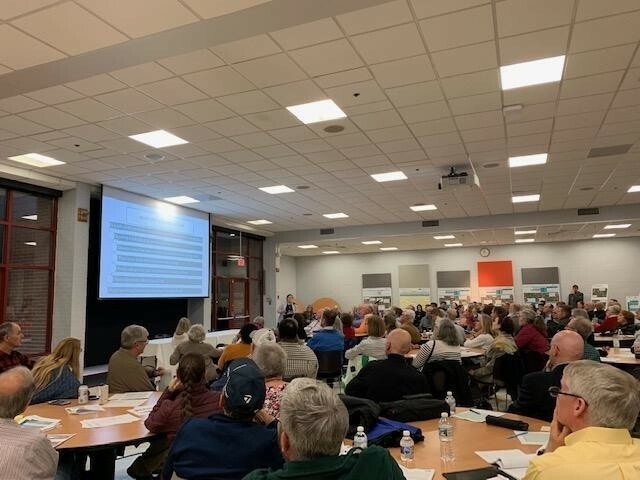 On Monday, March 25, City of Alexandria Transportation staff unveiled options to address safety issues on a section of Seminary Road east of I-395. The project offers an important chance to improve safety on a ~mile-long residential corridor that has been on the city's radar for a long time. Currenty, people drive too fast on Seminary Road. City data show that speeds remain excessive despite enforcement and reduction of the posted speed from 35 mph to 25 mph in 2016. Alexandria police conducted 945 traffic stops in 2018 on just the 0.9 mile section of Seminary Road east of N. Howard Street, which was 3.5% of all traffic stops in 2018. Enforcement is an expensive uphill battle when speeding is built into the street. Most of the road maintains two general travel lanes in both directions, creating highway-like conditions. Area of Seminary Road included in this project. Image by City of Alexandria. In 2014, the city posted a ‘wikimap’ that allowed participants to provide input about walking and bicycling routes and concerns. Seminary Road was one of the top bicycling routes where users described as “I currently want to bike.” The city’s 2016 Transportation Master Plan also recommended the Seminary Road corridor as a top 10 priority for protected or buffered bike lanes. Image by City of Alexandria. Alternative 1 ‘optimizes’ the existing layout, meaning that it basically remains the same but has some upgrades of pedestrian facilities and narrows the lanes a bit in hopes of bringing down speeds. Alternative 2 improves more accommodation for bicyclists with an painted lane. It also attempts to control traffic speed, minimize delays, and prevent crashes with narrower driving lanes, all while making it harder to turn into adjacent communities. This alternative has one travel lane in each direction as well as a center turn lane. There are some trade-offs—traffic will be delayed for about five seconds at one or two intersections—but it's the most safety-forward option. Why is Alexandria trying to change Seminary Road? Alexandria's Complete Streets policy, adopted in 2011, requires the Department of Transportation & Environmental Services to look at street improvements with an eye to improving things for all road users, not just cars, when the city is repaving. This road also has some specific concerns—like speeding and several crashes into telephone poles—which is why advocates have called for changes here for some time. The Alexandria Bike and Pedestrian Advisory Committee (BPAC) has been fighting for safer streets for all road users for years, and a newer group, Alexandria Families for Safe Streets (AFSS) more recently has advocated for safe streets, particularly for people who walk. BPAC, AFSS, and WABA all support Alternative 3 because we believe it's the safest option. By changing street design to include safe and comfortable accommodations for people who bike and walk, the city will also deter speeding and simultaneously incentivize these things. This project could also benefit Alexandria’s Safe Routes to School initiative, which seeks to improve walking and bicycling conditions for students. Advocates have noted that improving safety would provide transportation options to students at St. Stephen’s & St. Agnes School (SSSAS) and Hammond Middle School. About 200 people attended the Monday meeting, which included presentations from city staff, including Alexandria Complete Streets Program Manager Christine Mayeur. Some residents were worried that congestion in the area would increase, and that streets as far as a mile away would see increased traffic diverted from Seminary Road. Traffic congestion is a major concern in Alexandria, as it is in every jurisdiction in our region. That said, the section of Seminary Road under consideration already includes a merge from two lanes to a single lane east-bound through traffic, and drivers already factor that merge into their route considerations. Continuing east for 0.9 miles with a through lane, a center left turn lane and a bike lane can actually improve traffic flow east of N. Howard Street. Drivers will no longer need to weave around left-turning buses and other vehicles. City staff are also evaluating potential traffic signal changes to limit any increase in delay to about five seconds or less. The figure below shows projected Intersection delays under these worst case conditions. Five, 10, or even 30 seconds of additional delay seems a small price to pay for a configuration that could reduce crashes by 50% and will provide facilities to make walking and biking safer and more comfortable. Another concern that has been voiced is that emergency vehicle access will be impeded under proposed Alternatives 2 and 3. On the contrary, road diets often improve response time. “[A] Road Diet design opens a more predictable and practical path for emergency responders,” the report notes. This road diet is very similar to what the city did on King Street in 2016. Traffic calming on King Street included many of the same arguments for and against active measures designed to improve crosswalks, bike lanes, pedestrian crossing signals, signs, and other improvements for King Street west of Janneys, just up the street from the Metro station. Perhaps most importantly, zero reported traffic crashes have occurred in the first year of implementation, compared to an annual average of seven crashes during the 10 years prior to this project. That is a big deal—it's the type of success that the city is trying to recreate on Seminary Road. What's happening next with the project? There will undoubtedly be more debate about this project until staff recommendations come out at a community meeting in May. After the recommendation is finalized, it will be taken to the Traffic and Parking Board. Regardless of the chosen alternative, construction will begin in fall of 2019. Right now, the city is asking people to take a survey about the project. You can weigh in until Wednesday, April 10. Robert Gardner is the Advocacy Director at the Washington Area Bicyclist Association (WABA). Over the course of his career, he's worked on a range of issues, including health care, environmental justice issues and rural poverty. He spends a lot of time thinking about how we order our lives around personal vehicles. Jim Durham is a resident and volunteer in Alexandria, Virginia. He is chairman of the Alexandria Bicycle and Pedestrian Advisory Committee (BPAC), a volunteer-led organization that promotes walking and biking. He also serves on the Executive Steering Committee for the Partnership for a Healthier Alexandria (PHA), a citizen-led coalition of people and organizations that promote a healthy Alexandria.